Author(s): Khushboo Gulati, Krishna M. Poluri. Department of Biotechnology, Indian Institute of Technology Roorkee, Roorkee- 247667, Uttarakhand, India. Background: Unraveling the comprehensive networks of molecular signaling in various cellular processes and redesign/rewire them as per human wish is the ultimate dream of the biomedical researchers. Recent advances in the experimental and computational biophysics have provided us with enormous amount of protein sequences and a wide variety of structural information. Protein engineering is a fledging field and a creative process to design the target proteins or signaling networks with desirable structure and functions. 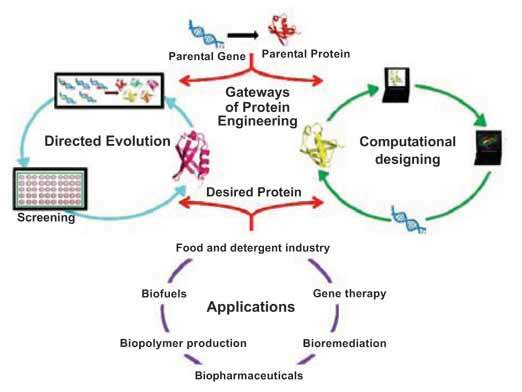 Objective: Protein engineering has been a powerful tool in bioengineering for last couple of decades for generating vast numbers of useful enzymes/proteins that possess huge therapeutic and industrial potential. Now it is the high time to review the existing technologies and tune these methods for a desirable purpose as per the demand of biotechnological/biomedical applications. Results: Numerous engineering approaches have been developed to generate synthetic protein universe with desired specificity and enhanced performance in comparison to their natural counterparts. The current review provides a glimpse of several of the important computational and experimental methods that are being widely used under the categories of rational design, de novo design, directed evolution and combinatorial approach. Conclusions: This review shed light on the technicalities, advantages and pitfalls of the existing methodologies along with their applications, recent patents obtained using the engineered proteins and the current and future perspectives of protein engineering techniques. Keywords: Protein engineering, directed evolution, rational design, combinatorial approach, de-novo synthesis, synthetic biology. Affiliation:Department of Biotechnology, Indian Institute of Technology Roorkee, Roorkee- 247667, Uttarakhand, India. Keywords:Protein engineering, directed evolution, rational design, combinatorial approach, de-novo synthesis, synthetic biology. Abstract:Background: Unraveling the comprehensive networks of molecular signaling in various cellular processes and redesign/rewire them as per human wish is the ultimate dream of the biomedical researchers. Recent advances in the experimental and computational biophysics have provided us with enormous amount of protein sequences and a wide variety of structural information. Protein engineering is a fledging field and a creative process to design the target proteins or signaling networks with desirable structure and functions.